I just wonder why he didn't leap into action like Zodd, especially being an assassin himself. Either he was but Femto gave the all clear before he could act (and we just didn't see whatever reaction he was having), he intuited that Femto wasn't actually in danger, some combination thereof, OR he was clued into the situation for some specific purpose while Zodd got the "no need to know" treatment. The least impactful interpretation is that we simply didn't see him going "!!" or whatever. I think those are all valid reasons. The two main points for me being that it all happened very quickly and that there was no need for him to act. Yeah, I've been quite interested to see how the Falconian society has all been set up so far, even simple things like the relationship between Owen and Locus. I'm looking forward to see how it all develops. Anyway, Locus could have indeed just asked Rakshas, although like I said earlier I don't think Rakshas would have needed much impetus to act anyway. I honestly believe that most apostles would have reacted similarly. Yeah it'll be interesting to see how it turns out. I've already voiced my speculation on this earlier (like 4 pages ago lol) so I won't repeat it, but it does open interesting dynamics. Although like Rupert said, Griffith could have anticipated Rakshas' actions and willingly let it slide. Also worth mentioning is that I'm not too sure Locus would really view Griffith as weak because of this, or if he did, well, that probably wouldn't be very wise of him (since Femto could presumably kill him by snapping his fingers). However I find his "overly worrying" and "easily angered on behalf of" attitude quite reminiscent of another person who once attended to Griffith: his former first officer, Casca. It's true that there was no magic at work there, but he still remains largely unreadable in my opinion. What was most telling to me, far more than his expression, was the fact he moved out to a balcony to watch Rickert leave the palace. That shows a certain attachment or melancholy and I think that's what made Locus so angry. Because beyond the slap, Rickert could reach Griffith in a way (emotionally?) no one else has been able to so far (outside maybe of Guts & Casca, and even then the boy's intervention muddles things up). I would have thought the Ganishka / Baboon fiasco had been a lesson learned. There's no reason it can't be both a cool setting and a peek into life 1,000 years ago. Well it certainly relates to the old city, however I don't think much can be gleaned from it at the moment. I think we can still assume with good certainty that it represented a man. As for why it was there... who knows? We don't even know what the place was (and there are many possibilities). For anyone that wants a copy and the additional booklet, CDJapan only has a few in stock. Thanks for the link Bender! I just checked and they have more in stock. Went ahead and secured my own copy! Whaaaaaaat? Man I missed that one! Anyway it was just rambling on my part on a boring day at work. Sorry to bring back old memories of a fiasco. But seriously? A baboon? good thing that was not the case. Wyald's design was awesome though. But Ganishka as a baboon? Whaaaaaaat? Man I missed that one! Anyway it was just rambling on my part on a boring day at work. Ah sorry man, I actually confused you with another member (who had speculated that). My bad! Hey no harm done man! What thread was that in? It could be fun read for me while I work? Cool, I imagine that they have only a few ordered on hand and once those sell they can continue to pick them up as ordered for a bit. In any case it's going down on his performance review, along with getting smashed by a pillar. Thinking of this like a bureaucracy, Locus could have even skirted the rules simply by relaying what Rickert did to Rakshas, while going light on the details of Griffith's reaction, and letting nature take its course, "trick of that knight, Locus" indeed. That's what I would have done. Also worth mentioning is that I'm not too sure Locus would really view Griffith as weak because of this, or if he did, well, that probably wouldn't be very wise of him (since Femto could presumably kill him by snapping his fingers). However I find his "overly worrying" and "easily angered on behalf of" attitude quite reminiscent of another person who once attended to Griffith: his former first officer, Casca. Well, that's sort of the way I meant "weak," not with contempt, but more recognizing, or perceiving, vulnerability. Great comparison to Casca, and really, for the same reasons (and perhaps validly held reasons as well!). Locus should just strip down to nothing but a tank top and yell at Rickert in a cave. That's everyone's free mental image of the day. I'm ashamed to say I didn't even consciously think of that, just sort of took it for granted but you're absolutely right. It was a bit of an odd transition imagining Griffith silently following Rickert with his eyes as he leaves the castle while everyone follows him bewildered and then, *smile* "Everything's fine!" I think that's what made Locus so angry. Because beyond the slap, Rickert could reach Griffith in a way (emotionally?) no one else has been able to so far (outside maybe of Guts & Casca, and even then the boy's intervention muddles things up). Out of the mouths of babes; if there is anything left of Griffith's humanity, or even just the vanity of it, in there it got a serious reality check from an un-impeachable source. Oh, I'm sorry that was insensitive of me. I thought that's what you were implying before when you referred to people in the past speculating on Grunbeld, Locus, and Irvine's natures. On a side note, his name is spelled "Rakshas" with an 'h'. It comes from the Indian word "Rakshasa". Oh really? I didn't know that. I got into Berserk by reading all of the Dark Horse volumes exclusively. In them (or at least my editions of them) they spell his as "Raksas", is that something that most Skullknight.net members think they got wrong? (similar to Shisu vs. Sys, do Vandimion vs. de Vandimion, Behe-l-it vs. Beherit, etc.). Oh really? I didn't know that. I got into Berserk by reading all of the Dark Horse volumes exclusively. In them (or at least my editions of them) they spell his as "Raksas", is that something that most Skullknight.net members think they got wrong? (similar to Shisu vs. Sys, do Vandimion vs. de Vandimion, Beherit vs. Beherit, etc.). Yeah I figured that was where you got it. And yeah, it's really quite likely they got it wrong. Not sure why either as it's not too hard to figure out. Walter asked me to take a photo of this double-page spread at the back of the 4-episode supplement. Some of these images showed up in episode 338, but the two panels at the top don't look familiar. They certainly weren't in 338. Perhaps alluding to episode 339? You're going to call me nuts, but I think Rakshas could turn out to more cat like. My only reason for saying that is because Rakshas, like a cat, is adapt at hiding, shrinking down into small forms*, and extremely agile. Of course, there's a lot more I'm not looking at or considering. That looks to be in Falconia. What's interesting though is that there's a full moon out, and I dont see any branches in the sky? The full moon was out recently on Guts side, so I wonder when in time is this? and if the branches aren't visible at night? Not calling you nuts at all. The thought crossed my mind as well, but I figured that Zodd was already partly feline and that it would be somewhat redundant, plus the fact his "appendages" are more stinger-like than claw-like. Nice, thanks for the pictures man. I've got to say, it's a curious couple of panels. I talked about it with Mangetsu yesterday (who'd also found them), and some details seemed odd to me. For example, the girls' reaction shot is eerily similar to the one from this episode. I also wonder what's up with that cloaked figure. Seems like it could only be Rakshas, and the length of the cloak (which covers a good part of the statue) could back the idea that his garment itself is part of his abilities, something we speculated about earlier in this thread. 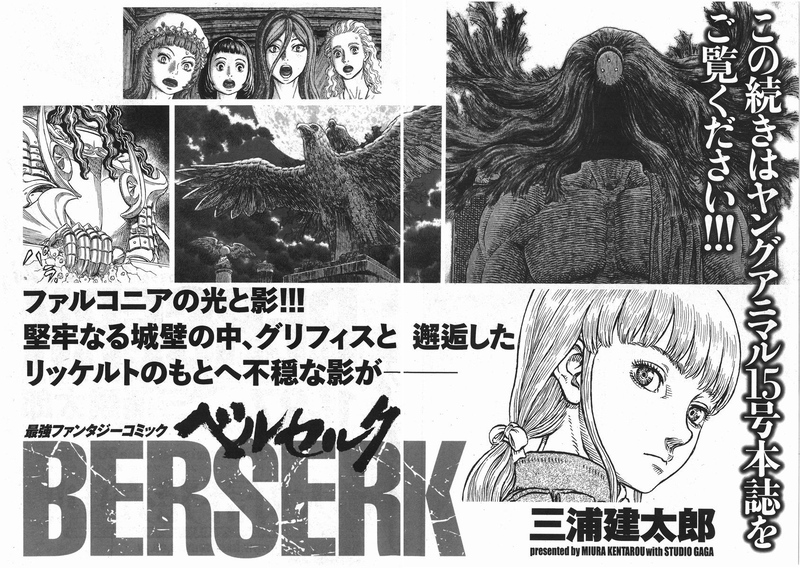 Anyway, both panels suggest the encounter with Rickert and the Bakiraka is long over. The remaining questions would then be: what's prompting this reaction from the girls (is it Rickert telling them what happened, or someone else telling them Rickert isn't coming back), and what's Rakshas doing on top of that pillar (observing, but what?). Indeed, good observation. The sky looks clear even though the World Spiral Tree should be visible overhead. Hmm... Could be that those panels were still works in progress when the staff at YA included them in there, but that'd be a strange decision. Then again, showing these panels over a month in advance is pretty unusual in itself. The remaining questions would then be what's prompting this reaction from the girls (is it Rickert telling them what happened, or someone else telling them Rickert isn't coming back), and what's Rakshas doing on top of that pillar (observing, but what?). Is it possible the reaction is based on Rickert/Erica's relationship to Guts? I'm not suggesting it is, just throwing it out there. Honestly, the cute moment with Luca and Daiba in episode 336 might be the only time that connection is acknowledged, albeit indirectly. As for Rakshas, the length of his cape also struck me. It seems much longer (and somewhat mirrors the wings of the statue below). I think the assumption it is part of his ability wouldn't be a stretch of the imagination. Everything's possible obviously, but the look on their faces corresponds more to a frightening/shocking news than a simply surprising one in my opinion. Or maybe they're speaking and the bubbles were cut. Anyway, I'm sure it'll be directly addressed eventually, it's just a matter of time. Rakshasa were most often depicted as ugly, fierce-looking and enormous creatures and with two fangs protruding down from the top of the mouth as well as sharp, claw-like fingernails. They are shown as being mean, growling like beasts and as insatiable cannibals who could smell the scent of flesh. Some of the more ferocious ones were shown with flaming red eyes and hair, drinking blood with their palms or from a human skull. Generally they could fly, vanish, and had Maya (magical powers of illusion), which enabled them to change size at will and assume the form of any creature. Do you think Rakshas can impersonate others beings ? You're going to call me nuts, but I think Rakshas could turn out to more cat like. My only reason for saying that is because Rakshas, like a cat, is adapt at hiding, shrinking down into small forms*, and extremely agile. Agreed. It would make sense, especially because many representation of Rakshasa beings are Felidae-like. Not saying Miura will do the same as everybody, more putting his magic touch like he did for Goura and the robotto theme. Male, as far as we know. Nothing has led us to believe that could be the case so far. But why the Barkilaka are interfering with the assassination of Rickert? Simply put, because Rickert has inside information about Griffith, and Silat wants it. To what end, we're not sure, and perhaps Silat doesn't either, but it certainly seems he has no interest in serving another Emperor, as he was already given an invitation (and as far as we know, all are welcome). So, instead he's waging a little spying offensive. Pretty impressively brazen, really. BTW, has it been considered that Rakshas was menacing Rickert with the intention, at least in part, to drawing out the intruders as well? He would have a pretty good idea it was the Bakiraka, and that they'd be interested in someone like Rickert. Also, assassins may not be the best saviors; they strike me as the type willing to torture for information. =) But I can also see Silat being against it, and Rickert and he making for strange bedfellows if they realize the significance of their big mutual acquaintance. Rickert is one of the few people that knows where Guts will be soon too. Funny out there thought: Rickert the Bakiraka weapons maker. BTW, has it been considered that Rakshas was menacing Rickert with the intention, at least in part, to drawing out the intruders as well? He would have a pretty good idea it was the Bakiraka, and that they'd be interested in someone like Rickert. It came to mind, though that feels overly complicated when thus far Rakshas always seemed able to get the drop on them. If he had been onto them I feel like he could have probably acted in the palace directly, instead of waiting for an opportunity he wasn't sure would come. Well I know who I would choose between the apostles and the Bakiraka. I'd have it both ways and choose Rakshas! Rickert's results may vary. We will in The Band of the Beast. Sure, so then did they really just get the drop on him? Well the pillar certainly did. It's just strange he's out killing some kid while potential assassins roam the palace (only to be jumped by said assassins). "Some kid" who slapped Griffith within the inner sanctum, a feat "The Emperor of Terror" could not come close to, despite throwing everything he had and more at it. I can understand how that (not to mention Griffith's acceptance of it) would distract Rakshas (and Locus, and anyone else) from investigating a couple of knocked out guards (something Owen is already doing anyway). Besides, to give credit where it's due, not only are the Bakiraka the best at this kind of thing, they've also got experience with these players. Distracted indeed, that's why I'm incredulous; they better not get "distracted" and leave it to Owen when Guts is around or Griff will get slapped with more than an open palm! Also, why didn't the Bakiraka fo better to hide the bodies? Was thst a distraction itself? I'm questioning everytning! Distracted indeed, that's why I'm incredulous; they better not get "distracted" and leave it to Owen when Guts is around or Griff will get slapped with more than an open palm! Oh I'm sure they'll be very focused on eternal suffering in the Vortex of Souls by the time Guts comes around to slap *splat* Griffith. Also, why didn't the Bakiraka fo better to hide the bodies? Was thst a distraction itself? I'm questioning everytning! Might have indeed been a distraction in itself, and besides, hiding the bodies would have made it even more suspicious, whereas upon finding that nothing was stolen or displaced, they'll probably wrap it up and conclude it was a non-event. That is, unless Rakshas tell them about it. Also, I found it interesting to see the parallel between Rickert and Guts' paths in this episode, specifically regarding their reevaluation of their life, and their realization that while they've lost a family (the Band of the Falcon), they have found another. Guts went through this after the Qliphoth in volume 26 and it's developed since then, and the scene is really similar here. Only Rickert has more of a dilemma, because he has to balance his revulsion at what Falconia stands for with his desire to protect Erica. I'm interested to see how that will develop.